An international team of researchers has found that it is possible to use the human bony labyrinth of the ear as an indicator of dispersal from Africa. 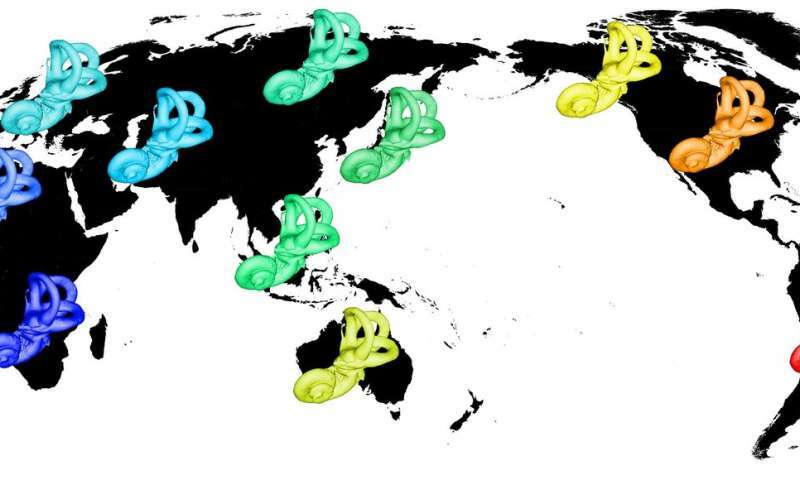 In their paper published in Proceedings of the National Academy of Sciences, the group describes their study of hundreds of ancient ear bones from around the world and the differences they found among them. As archaeologists continue to piece together human history, they look for new ways to interpret evidence that may already be in hand—such as ancient human bones or fossils. By studying the way the skeleton has changed from the time when our ancestors were in Africa until today, researchers have created a kind of map of the migration of humans around the world. In this new effort, the researchers focused on the bony labyrinth, the three bones of the inner ear—the cochlea, vestibule and semicircular canals. Together, they appear as a sort of labyrinth for which they were named. The researchers started with the knowledge that as time passes, bone structure tends to change—and the bony labyrinth has proven to be particularly hardy, remaining mostly intact in skeletons when arms, legs and other bones have been broken, crushed or lost completely. They further noted that earliest humans that migrated from Africa would have had the longest amount of time to evolve as they moved to other places. And those that migrated the farthest would likely be among those who migrated the earliest. This, they believed, suggests it should be possible to use evolutionary changes in the bony labyrinth as a means for charting human migration. To test their theory, the researchers collected and analyzed 221 skulls, which included 22 unique populations from various time periods. They looked at the differences in the bony labyrinths, and once they had been identified, the researchers compared the differences they found with data from other studies attempting to create migration maps. The team reports that their original idea aligned with their research data—those humans with the greatest amount of change in their inner ear bones were among the group that left Africa the earliest and traveled the farthest, demonstrating that the bony labyrinth could, indeed, be used as a new tool to help in adding pieces to the puzzle of human history. The dispersal of modern humans from Africa is now well documented with genetic data that track population history, as well as gene flow between populations. Phenetic skeletal data, such as cranial and pelvic morphologies, also exhibit a dispersal-from-Africa signal, which, however, tends to be blurred by the effects of local adaptation and in vivo phenotypic plasticity, and that is often deteriorated by postmortem damage to skeletal remains. These complexities raise the question of which skeletal structures most effectively track neutral population history. The cavity system of the inner ear (the so-called bony labyrinth) is a good candidate structure for such analyses. It is already fully formed by birth, which minimizes postnatal phenotypic plasticity, and it is generally well preserved in archaeological samples. Here we use morphometric data of the bony labyrinth to show that it is a surprisingly good marker of the global dispersal of modern humans from Africa. Labyrinthine morphology tracks genetic distances and geography in accordance with an isolation-by-distance model with dispersal from Africa. Our data further indicate that the neutral-like pattern of variation is compatible with stabilizing selection on labyrinth morphology. Given the increasingly important role of the petrous bone for ancient DNA recovery from archaeological specimens, we encourage researchers to acquire 3D morphological data of the inner ear structures before any invasive sampling. Such data will constitute an important archive of phenotypic variation in present and past populations, and will permit individual-based genotype–phenotype comparisons. So we have a record of where clumsy people came from? What will future archaeologist find in about a 100 years, across the globe; these mysterious circular holes? As a team from Andromeda measure some atomic events less than a 100 years or so. These skulls! Peculiar! Self Destruction? So, he took off on a boat! Hopefully this skull labyrinth will shed some light on the labyrinth of the concocted social construct of race in which the world is lost. Alleles and ecotypes may differ but the fact remains that a random group of ten bonobo chimpanzees have more genetic diversity than does the entire human population. Even with this new information the question remains the same: How to end human stupidity while avoiding the extinction of the species? Sir one thing that I want to understand because our Vedas the most ancient scriptures says that first man was originated in ice capped area and called as Hindus as Him termed in English as ice and dau in English call generated. Secondly Vedas says that initially there was six month day and six month night. This also confirms that the residents were from Arctic. Thus neanderthals and their ancestors must be the first human. The Pangaea also reveal that land has shifted from Arctic to Equator with the passage of time. The problem with religious source texts is that they contain some grains of ancient knowledge and wisdom together with a boatload of misunderstood, falsified or plainly intentionally made-up stuff. Fascinating enough, there seems to be a little sliver of ancient knowledge in your citation from the Vedas. You will have noticed several recent scientific studies that challenge the prevailing assumption that all modern humans right now on Earth would have exclusively evolved from human ancestors in Africa. Extremely old human bones were found in Southern European countries. And a very wise man from the current time whom I respect greatly wrote already many years ago that humanoids had in parallel developed at several places on the planet, with its earliest instance occurring in Scandinavia. So pretty cool that the Vedas got that one right, mentioning an area closer to the poles.